Georgia quarterback Jake Fromm is the unquestioned starter after practicing behind Jacob Eason two springs ago and fending off Justin Fields this time last year. 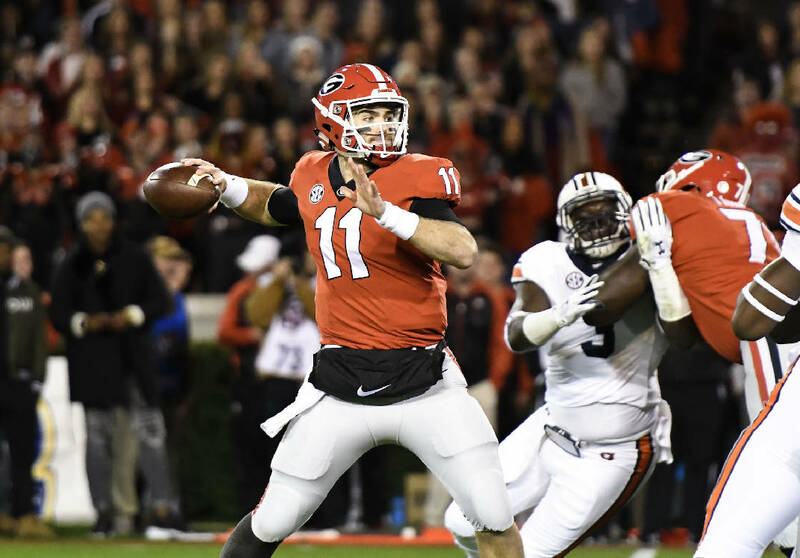 As a freshman, Georgia quarterback Jake Fromm entered spring practice as the backup to Jacob Eason but became the starter in the season opener when Eason injured his knee. Fromm began last spring as the returning starter but having to fend off five-star newcomer Justin Fields, which he managed to do. Fields transferred away in early January and is now at Ohio State. The third spring at Georgia for Fromm began Tuesday afternoon, and he is the clear starter after guiding the Bulldogs to 24 victories, a pair of Southeastern Conference Eastern Division championships and one overall SEC title the past two seasons. "I'm definitely a lot more comfortable, and I definitely know exactly what's going on, even more than I did last year," Fromm said Tuesday in a news conference. "Things have slowed down, and it feels like the offseason program is getting easier. We're not just surviving through the workouts. We're thriving through them." The 6-foot-2, 225-pounder from Warner Robins practiced Tuesday with a new coordinator, James Coley, and without several weapons he possessed last season as the Bulldogs went 11-3 and played in the Sugar Bowl — running back Elijah Holyfield, tight end Isaac Nauta and receivers Terry Godwin, Mecole Hardman and Riley Ridley. Georgia also has to replace Lamont Gaillard at center, but the Bulldogs have complete stability at the sport's most important position. "I'm excited about Jake and the growth he's been able to give us," Bulldogs fourth-year coach Kirby Smart said. "He's really been a tremendous help to the other two quarterbacks who are here. Obviously we've got a lot of confidence in Jake in our offensive system and his understanding of running the thing." Backing up Fromm are Stetson Bennett, a former walk-on now on scholarship following a stint last fall at Jones County (Mississippi) Community College, and early enrollee D'Wan Mathis. Smart said Bennett and Mathis will receive a "ton of reps" and that those reps would be distributed evenly. Fomm admits he is serving in a mentor role for both. The Bulldogs are practicing with the motto of "If it doesn't challenge you, it doesn't change you," but not everybody is healthy enough. Among the players out this spring are senior defensive linemen Julian Rochester (knee) and Michail Carter (shoulder), freshman linebackers Rian Davis (knee) and Trezman Marshall (shoulder) and freshman tight end Ryland Goede (knee). Redshirt freshman running back Zamir White, the former five-star who tore his ACL last August during a preseason scrimmage, is limited. "Any time you have a noncontact ACL injury and it's your second one, you've got to be careful, because you're talking about two different knees," Smart said. "When that happens, it makes you wonder if the kid is going to be able to progress this time as fast as he did last time. He's running really well and doing a lot of straight-line stuff. He's just not going to be involved in the scrimmaging and the contact parts. "I will not know how he might contribute to the team until early in fall camp, but I've been very pleased with his work ethic. He does everything we ask him to." Georgia will hold its Pro Day this morning and resume practices Thursday afternoon. The SEC Network's Paul Finebaum recently discussed a more strained relationship between Smart and his former boss, Alabama coach Nick Saban, due to some recruiting battles between the two programs. Smart on Tuesday denied that being the case. "I don't have any problem or issue with Nick," Smart said. "As a matter of fact, I don't think our relationship has done anything but grown for more respect since we've played them twice. We have a great relationship. We're not texting and calling each other all 'buddy buddy,' but I'm not doing that with anybody. "I have a lot of respect for him, and I wouldn't be where I am today without him."